There are lots of games grandparents play with their grandchildren. But there’s one game grandparents shouldn’t play with their grandchildren. It’s the “swab the grandkids for DNA” game. At least not without the consent of the intermediate generation. Because that could get the grandparents into serious hot water. First and foremost, the issue comes down to a matter of the rights of the parents to control over their kids, their kids’ lives and their kids’ privacy — over and above any interests of the grandparents. Sure, Granddad may want to know whether Grandson is really Son’s kid… but he doesn’t have the right to make the decision to get Grandson tested. Stated simply, the parents have the right to decide if the kid gets the DNA test. Not the grandparents. The law is definitively going to side with the parents if this ever becomes an issue between the generations. 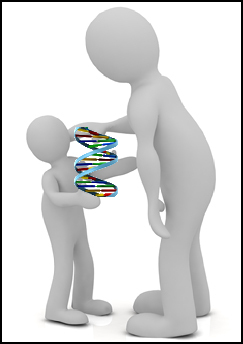 So even if Granddad would love to know whether Grandson is really his grandson… hands off the kid’s DNA. Hard enough to face that kind of information when the parents have carefully thought it through. Impossible to even contemplate if it comes up through a test that the parents didn’t even know was being done. Adding up all these concerns, playing “swab the grandkids” is a really bad game to play.